Americans look forward to Memorial Day for many different reasons. Some of us look forward to the long weekend, and others look forward to the coming together of family and friends. 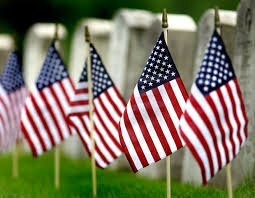 But on Memorial Day, we are all united in remembering our fallen soldiers who died fighting for our liberty and our rights. Memorial Day was formerly known as Decoration Day, and it was originally conceived to unify the Union and Confederate armies after the Civil War. In the nineteenth century, Congress expanded the holiday to include all deceased war heroes from American military. In 1971, Congress made it a federal holiday and officially renamed it Memorial Day. Since then, it has been celebrated each year on the last Monday of May. As we all know, Memorial Day has become a great American tradition. Every year, in Washington D.C.’s Arlington Cemetery, an American flag is placed on every gravestone . The array of flags serves as a national display of appreciation that instills inspiration and patriotism into the lives of all Americans. The same is true for local cemeteries who have people visiting and honoring fallen soldiers with flags or flowers. Since the day falls on a Monday, it is usual to see people at the local lakes or beaches enjoying a picnic or BBQ with their loved ones as they wrap up the three-day weekend. For many of us, Memorial Day also serves as the ushering in of summer. It marks the beginning of the sunny summer days. As the day approaches, we at Chad West, PLLC hope you all have an enjoyable, safe, and memorable weekend! We also extend our eternal gratitude to our fallen heroes, everywhere and throughout history. Without their sacrifices, America would not be the great country it is today.